What are the historically-correct methods for suspending Oakeshott Type X-XI swords of the 12th Century? I decided to do some detailed research on this subject. Feel free to add more information and corrections. First, I searched for examples of Type X-XI swords in medieval books, effigies, illuminated manuscripts, paintings, extant swords, scabbards and modern research articles. Then I compiled a catalog of the various Type X-XI sword belts and scabbards. Generally it is not possible to differentiate between the individual types of 12th Century swords using this methodology, so all four types of 12th Century swords (Types X, Xa, XI and XIa) are all considered together as one group. There are no extant scabbards from Type X, Xa, XI or XIa swords for us to review. Fortunately, the manner in which these swords were suspended in their scabbards is represented to some degree in illuminated manuscripts from the 12th Century. Sword belts of Oakeshott Type X, Xa, XI and XIa swords were almost always all wide (approximately 2 to 3 inches wide), very light in color (or white) and fastened by a knotted thong (Figures A and B). These will be referred to herein as "wide thong belts." Figure A: A typical 12th Century sword belt. It is made of a wide, lightly-colored or white leather and fastened by knotting a thong. From Folio 101, "Martydom of Peter and Paul," from the illuminated manuscript The Ottobeuren Collectar, Germany, dated to the last quarter of the 12th Century. Figure B. A late 12th Century sword belt (AD 1160-1180). It is made of a medium-width, lightly-colored leather and fastened by knotting a thong. The sword's pommel appears to be in the shape of a "brazil nut," which suggests that the sword is an Oakeshott Type X. Image detail from "Scenes from the Life of David," from the illuminated manuscript Morgan Bible, England, AD 1160-1180. Wide thong belts were undecorated and generally did not have any decorative mounts. 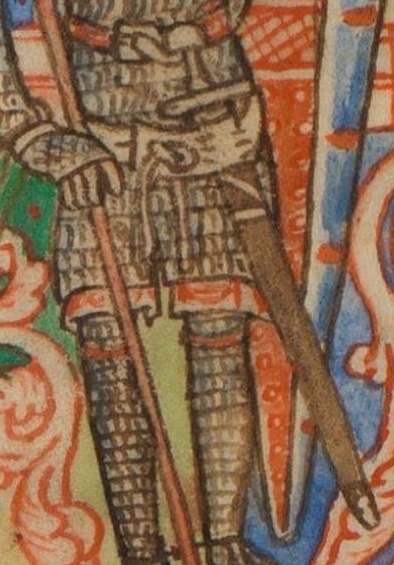 However, one illustration from the late 12th Century shows a white sword belt with a linear array of round dots that could represent small mounts (Figure C). Similar representations from the 13th Century images show clearly that these dots along the entire length of the belt are holes for the buckle prong, and must have also served a decorative purpose. However, neither belt buckles nor mounts were used in the 12th Century, so in a 12th Century image the nature of these dots is not clear. Figure C: A linear array of dots on a wide white sword belt may represent some type of belt mount. Similar representations from the 13th Century images show clearly that these dots along the entire length of the belt are holes for the buckle prong. Image detail from folio 7 verso, from the illuminated manuscript Psalter of Henry the Lion, Germany, c. AD 1168-1189. "Hitherto we have seen the belt attached solely to the top of the scabbard, the result being that the sword constantly hung in a more or less vertical position, and vibrated inconveniently. This was found to be an evil both on foot and on horseback." The illuminated manuscripts contain important clues about the manner in which scabbards were suspended vertically from the belts. Most importantly, you will notice that when the sword belt disappears behind the scabbard it reappears on the other side at the same level. This is strong evidence that the sword belt was a single, continuous piece of leather, and the scabbard is bound to the belt in some manner. (The offset sword belt was not developed until about AD1200-1220.) There are a few effigies and depictions in the illuminated manuscripts from the 12th and 13th Centuries that show that this is exactly the case. Medieval sword suspension methods have not been named in the literature, so I will take the liberty of naming this the "vertical" suspension. There is one very important image in 12th Century illuminated manuscripts that depicts clear detail of a vertical suspension (Figure D). Figure D. A late 12th Century (AD 1175) image from France that clearly shows that the belt is laced through the front of the scabbard. While this lacing through the front of the scabbard is unique, it does clearly show that the belt is a single, continuous piece of leather. Image detail from folio 51 recto of the illuminated manuscript KB 76 E 11 Bible, France, AD 1175. More commonly, 12th Century images show a vertical suspension in which there is lacing in the scabbard's cover. These laces form an X" or a backwards "Z" pattern (Figure E). Sometimes the tails of the laces were knotted on the outside of the scabbard and the ends hung like tassels (Figure F). It is not known exactly how these laces attach the scabbard to the belt. Figure E: A typical "X" lacing pattern on a 12th Century scabbard. Image detail from folio 41, "Holy Women at the Tomb," from the illuminated manuscript The Siegburg Lectionary, Germany, dated to the second quarter of the 12th Century. Figure F: A typical backwards "Z" lacing pattern on a 12th Century scabbards. Image detail from the illuminated manuscript Hortus Deliciarum, France, c. AD 1185. Since there aren't any extant scabbards from Type X-Xa or XI-XIa swords, we can only presume that they had a wood core and were covered with leather. We know that these scabbards were covered with something because we can see the belt lacing in the covers. Scabbards from later centuries were usually covered with leather and, less frequently, velvet. In illuminated manuscripts, the overwhelming majority of these scabbards are dark brown in color. Rarely the scabbards appear to be the same light color as the belt. No other colors were seen, although many illustrations are in black and white. Integrated rain guards do not appear in illuminations until late in the 12th Century, at which time they are moderately common. Chapes also do not appear in illuminations until late in the 12th Century at which time they are common. All of the depicted chapes have simple geometric forms such as that shown in Figure G. The Oakeshott Type XII swords were also prevalent in the late 12th Century, and it is impossible to determine from the manuscripts if the chapes are associated with Type X, Xa, XI, XIa or XII swords, or all of the above. Figure G: A simple chape from the 12th Century. Image detail from folio 50 verso, Navarre Picture Bible, Spain, AD 1197. Other features, such as leather tooling, risers, rings and lockets, are not found on 12th Century scabbards in the illuminated manuscripts. -Scabbards were hung vertically from the sword belt. The offset sword belt had not yet been developed. A really great introduction to this subject, and nicely illustrated with excellent examples. If I may offer an observation of my own: it seems to me that, from circa 1175 AD to 1200 AD, black scabbards become especially popular. It's true that brown scabbards are also found, and a sizable number of scabbards in black and white manuscripts are shown having no colour. Whether these should be interpreted as being white, or having some other form of light colour (aside from dark brown or black) is up for debate. Just the same, it seems the overall proportion of black scabbards rises significantly at this time, which is something that modern collectors or reenactors might want to take into account. Here is another example of suspension of Type X-XI swords from Germany in the late 12th Century, showing wide thong belts and vertical suspension. Note that the sword belt disappears behind the scabbard, and then reemerges on the other side of the scabbard at the same level. This shows that theses are not offset sword belts, but vertical suspensions instead. The wrap around the upper scabbard is in the "backwards Z" pattern. Integrated rain guards are present at the throat of the scabbards. I've been digging through your various postings with great interest. I applaud your efforts to not only thoroughly document what you are finding but sharing it with the rest of the community. I think through my dozens of books and think to myself "I really should compile this into a reference guide for when someone wants to me to make a scabbard for an Albion XYZ or an A&A ABC." I keep thinking I don't have the time to do so... but you may have inspired me to think more seriously about it! For those of you, including myself, who were wondering what an offset suspension looks like there is a really good example in this image from the BNF Arsenal 1186 Psalter of Saint Louis and Blanche of Castile, which is dated to 1225 AD. Notice also a rare example showing the strapping of a flat-top kite shield. I found a new 12th century German miniature for you. It has a chape, and shows the suspension system quite well. Also of note is the lack of fingers on the mail hand covers. Bible, Judas Maccabeus , ULB Düsseldorf Ms.A.2 fo.151v, 1150-1175, Köln, Benediktinerabtei Groß St. Martin. Excellent find Mart! That image is also one of the only one that displaces much of the reverse side of a flat top kite shields. If the image is representative, it would seem that kite shields even have patterns on the back! Regarding the chape, my guess is that this image should be dated closer to 1175 AD, since all the other evidence of chapes first appearing point to this late date. It's a very interesting find, especially since it does not show the standard horseshoe chape that seems to have dominated scabbards in the 12th and 13th centuries. Interesting image, clearly shows a vertical suspension. I think that I am going to try to reproduce that suspension method for one of my swords. Gotta work out how it's attached, and the lacing pattern. One method of attaching it would be to start with the main thong, then attach a separate piece of the same fabric. This second piece of fabric could be used to sandwich the scabbard between it and the thong. Then it could be stitched to attach it to the main thong. I have no idea if this was done historically, and I don't see evidence for it in the image, but it is one possible option. Another way would be to cinch the thong very tightly around the knight's waist, such that it effectively "pins" the scabbard into place, sandwiching it between the thong and the knight's mail. I'm not sure if this is viable; I would worry about the scabbard slipping out, but one would have to try it to know for sure. It looks like the belt is sewn on both sides of the scabbard - sewn to something in the back. I am also wondering the lacing straps that are visible below the belt. Maybe I'll play with something, but the details would be pure speculation. However, neither belt buckles nor mounts were used in the 12th Century, so in a 12th Century image the nature of these dots is not clear. If you look at these effigies http://www.themcs.org/armour/14th%20century%20armour.htm can you see that both Geoffrey de Mandeville 1st Earl of Essex and Hamo de Weston had sword belts with buckles. They are made 1185-1189.